One of my best friends is having a birthday today (happy birthday to you, Bassvocals!) and the Epic Friday crew celebrated over the weekend. I wasn’t going to. But now I wanted to, and I remembered that his birthday was coming up. I also remembered that he liked chocolate chip cookies. As we all know, cookies are not cake. And so, I was able to bake him something AWESOME (and diabetes-inducing) for his birthday while still obeying his annoyed command to not make him a cake. Everyone wins, and now I have something else to write about in my blog. HOW DO I MAKE THIS EPIC CAKE, you may be asking yourself. Well, it’s flipping easy, and delicious. It also doesn’t require an electric mixer, because those are for rich people. Step 2: Combine melted butter (2 sticks), eggs, vanilla, and sugars (brown and white) and stir with large spoon until it’s all blended nicely. Step 3: Add in the baking soda and the salt, stir until it’s all mixed in. Step 4: GRADUALLY add the flour (add some flour, stir it in, add more flour, stir it in, and so on.) Eventually it will get too hard for you to stir with a spoon, so wash your hands, clean off the spoon, and dig in with your fingers. Gush the dough around until there is no flour visible on the edge of the bowl or in the dough. Then make sure it all packs into a neat ball. If the dough is too gritty and won’t pack together, add 2 tbsp more butter. If it’s too greasy and drippy and doesn’t feel right, add a teeny bit more flour until it feels right. Step 5: Now squish in your chocolate chips! Make sure they’re as evenly mixed as possible. Step 5: Spray the heck out of your cake pans with the non-stick cooking spray. Step 6: Separate your dough into four balls. Flatten each ball into the bottom of a separate cake pan (you will have to do multiple batches if you do not have four cake pans) and stick ’em in the oven. Step 7: Set your timer for 15 minutes– check on your cookies after 10 to make sure they aren’t browning too fast. If they are, put some tinfoil over the top of the pan. Step 8: Take the cookies out when they’re done and let them cool for 5-10 minutes, then flip them onto a cool cookie sheet to cool off. Layers must be completely cool before the cake is assembled. Be very careful not to flip them out too soon or they will crack/crumble and your life will be ruined. Step 1: Combine everything into a bowl. Step 2: Pick up your whisk and start beating the heck out of it. Beat and beat and beat. Your arm is going to get tired but just keep whisking that cream. Make sure your cookie layers are completely cool. Place the bottom layer face-down on the plate on which you would like to serve your cookie cake (trust me, you’re not going to want to trans-plate this beast when you’re done with it.) Slather on a thick layer of the creamy frosting stuff you just made, and gently place the second layer on top of that, face-down. Slather more cream. Place third layer face-down. Slather more cream. Place fourth layer face-down. Now frost the entirety of the outside of the cake. 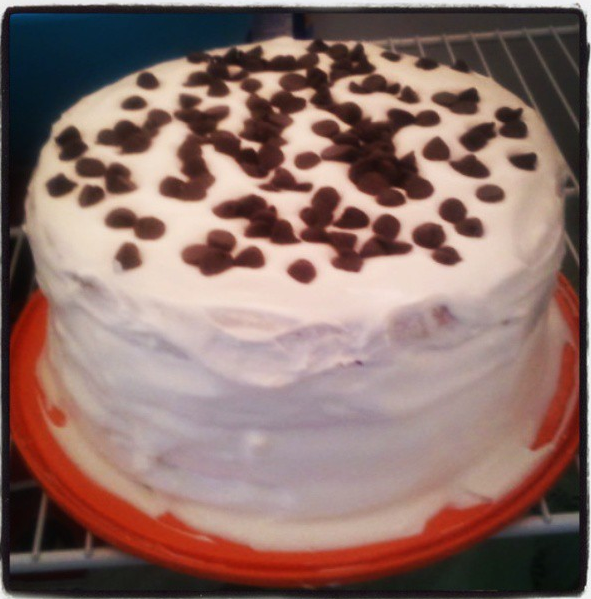 I sprinkled chocolate chips over the top of my cake as well. I recommend doing this as soon as you finish frosting the cake, as the cream kind of sets and solidifies a bit and it will be harder to make them stick after a fashion. Place your beauteous masterpiece in the fridge overnight. The cream is going to soften the layers just enough to make them easy to cut through, like a cake. The frosting isn’t really heavy or all that sweet, which will counteract the oversugaryness of the cookie layers. Sort of. Your cake’s recipient will NEVER KNOW WHAT HIT THEM. Is it a cake? Is it a cookie? Has their entire life been a lie? I didn’t frost the whole cake when I initially made it. I just put the frosting between layers and then frosted the outside the next morning. We basically needed a hacksaw to cut through the damn thing, making for a hilarious twenty minutes of serving it up without destroying it. Bassvocals tells me that the cookies were much softer the next day after hanging out in the fridge another night. Next time, I would probably only do two or three layers. The cake was absolutely delicious, but even one piece of cake was a bit much for us. Thank you so much for reading! Let me know how this turns out for you if you give it a try. Don’t forget to like/comment/subscribe/share! Posted on April 15, 2013 by Miss Molly Stewart	• This entry was posted in Baking!, Recipes!. Bookmark the permalink.